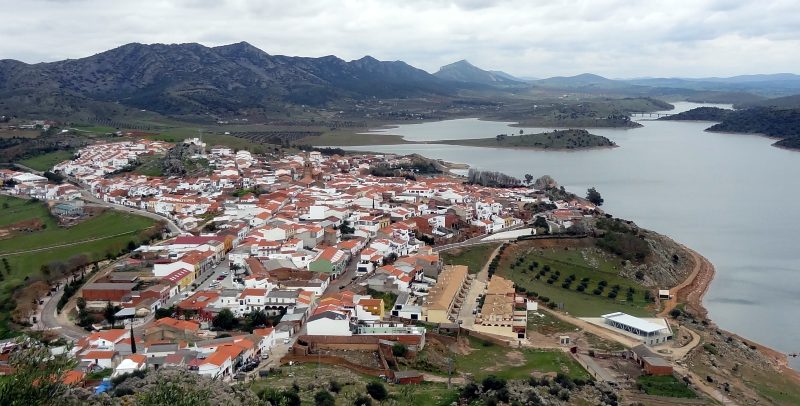 The upper image corresponds to the village of Alange, in the Spanish province of Badajoz. The dam was completed in 1992, with a wall 67 m high (from foundation) and 720 m long, so what until then was just a village over the Matachel river became a space marked by water and a new coastline. 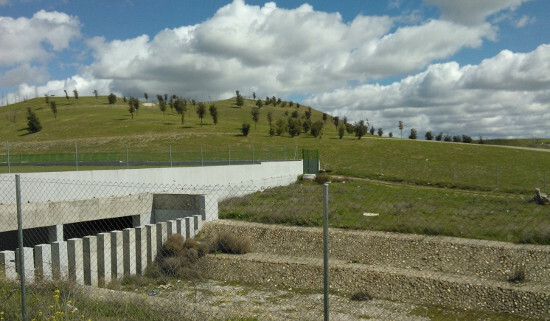 This is no doubt a project beyond the means of a small municipality, and was managed by the Guadiana Water Board. This action produces a new landscape that allows the use of water for irrigation (in lower lands there is a wide agrarian plain) and electricity production. The reservoir has a catchment basin of 2.545 sq km (which is equivalent to 60% of Rhode Island), and its water surface, of some 35 sq km, is marked by some islands which display the geology of the area. The areas that were to be underwater were cleaned of all vegetation, so when the water level changes sometimes the shores look rather arid, in contrast with a much greener area of lands above water. Water has brought relevant change; a neighborhood was moved as its precedent site was flooded, some new buildings respond to the new landscape, and it is fair to think that the payments to the owners of land taken to be submerged must have somehow influenced the local economy. There sure was an impact due to the flooding of the lower valley agrarian land, usually a fertile one. Over a stretch, the new layout of the road goes between the urban edge and the water, but its physical configuration is not very attractive. Water has become the central element of an area of the Natura 2000 European Nature considered a Relevant Birds Area; birds have become users of the reservoir. But people are becoming less relevant in number; there were 2.031 residents in 1996, and in 2014 this number fell to 1.946. Both cities are the core of metropolitan areas; Lyons is close to 2,1 millions, Pittsburgh nears 2,3. Both territories are complex, beginning with their definition. But for remote islands, metro areas are never easy to define, and most of the time you are in fuzzy territory. Some things can somehow be measured, like functional relations, but this is not necessarily, what gives you a coherent territory. So defining the limits to your plans is quite an art, sometimes, as politics also count. Regional plans are an interesting instrument; they address many things people care about in their everyday life, as large-scale landscape quality, transportation or efficient infrastructure. But in some countries, due to the lack of a separate planner professional career there is a confusion with urban planning and design; regional planning does not deal with architecture or building heights, but for some cases in which the issue appears through landscape quality regulations, as when dealing with skyscrapers (an even there, often in a tangential way). Lyons is quite French, in the sense these 2,1 millions are distributed in 514 Communes according to the metro statistical definition of 2009. As this is a territory surrounded by mountains and rivers, and some parts have deeper links with the core than others (the will to enter a club also counts…), in the end you have a complex shape when you define a regional planning scope. So the SCOT (Schema de Coherence Territoriale) 2030 Agglomeration Lyonnaise covers just a part of that large area. Just 73 communes, which house 1,32 million and most of the jobs on 730 sq km. 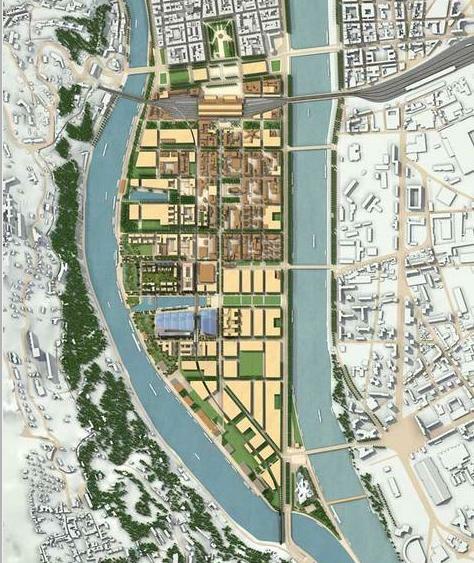 When it comes to regulate physical things like architecture, there is the Plan Local d’Urbanisme of the Communauté Urbaine de Lyon (just 58 Communes, that have agreed to use a common format for their planning instrument… in that sense, French planning is a bit like a set of Russian dolls, scaling up or down…). 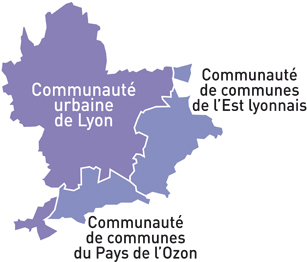 8 of these communes are in fact wards of Lyons proper (some 400.000 on 47 sq km). The limits of metro Pittsburgh (metropolitan statistical area) covers 7 Pennsylvania counties. But the South-western Pennsylvania Commission, which manages the regional plan, covers 10 counties, with an overall population of 2,57 million on a 18.432 sq km area. Just in order to compare, Allegheny county, in which Pittsburgh is, is 1,22 millions, on 1.929 sq km. So, yes, it is less dense than Lyons (small surprise in that). This is what comes to mind when you see Lyons, in France, as the Rhone and the Saone river converge. The central city is a long, narrow peninsula between both rivers. Factoring (some…) things apart, Pittsburgh is not that far from the concept: hills, rivers and people. It is interesting to confront an American city that simply can not be a grid (too steep land) to an european one. This is the area of San Pascual, north of Manila. What is striking is not what seems (I have never visited the Philippines) to be an urban sprawl dynamic, quite common on many places around the world, but rather the fact that most of the “greenfields” seem, in fact, water… Which in a costal plain means a great chance for climatic (or mere tide) vulnerability, and probably also means these areas are not the most favorished… The image has an aesthetic beauty, but I’m far from sure that this translates into a healthy living context. Anyone knows the area? 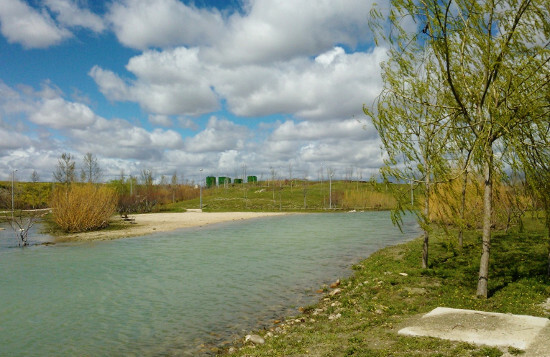 The project for the Parque de la Gavia in Madrid calls for a re-use of sewage water, whose treatment will be ensured partially by natural filtration ponds whose moisture help the growth of vegetation. The project, by Japanese architect Toyo Ito, was suposed to be part of the Madrid Olympic bids, incorporating some water sports. Nowadays it has gone from project to reality, a tricky bussiness for parks. Architects usually tend to see their buildings in their best shape when works are finished, but park designers usually integrate in the design the growth process, so a new park can be somehow underwhelming, especially compared to the expectatives raised by a park whose geometric design was part of the game. 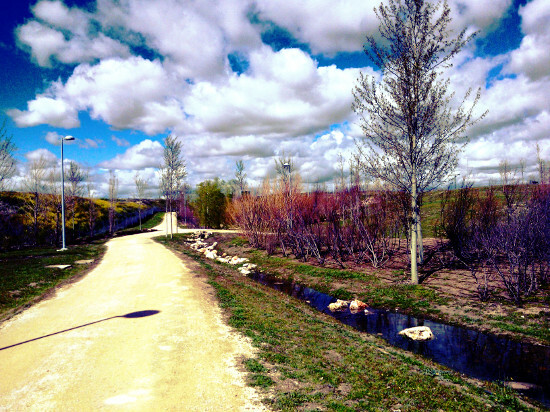 But in fact, the park delivers what should be expected: an open space in a mostly dry area of southeastern Madrid, which at least will use recycled water… and the growth of the trees coul give a good result, if handled with care. One of the ponds presented in plan as “water trees”. The historical core is on the Fourviere area, on the Saone banks, and has expanded to the east. 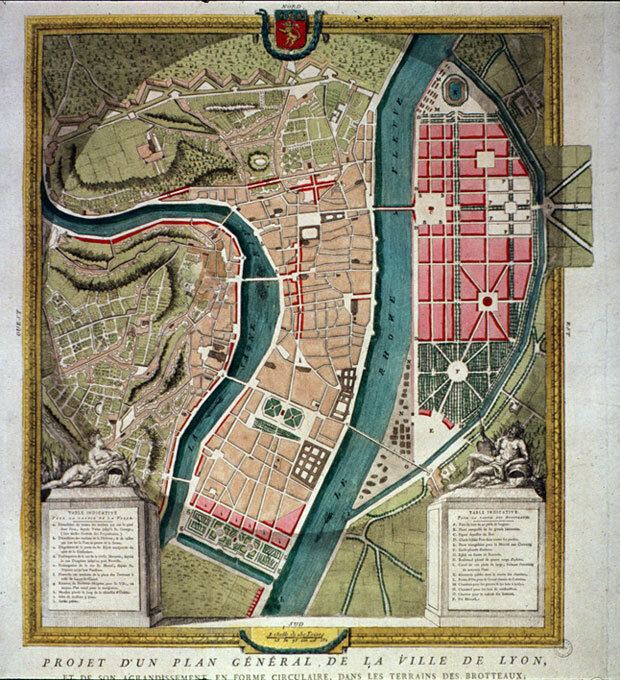 Th 1764 plan by Jean Antoine Morand shows a vision of the consolidation of the city on the river crossing. 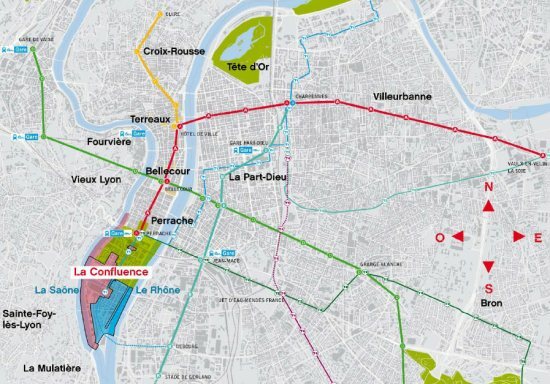 The junction of the Rhone and the Saone, whose position has changed over the centuries due to the fluvial dynamics and canalization works, has been until recent dates a haphazard suburb with industrial and rail uses. 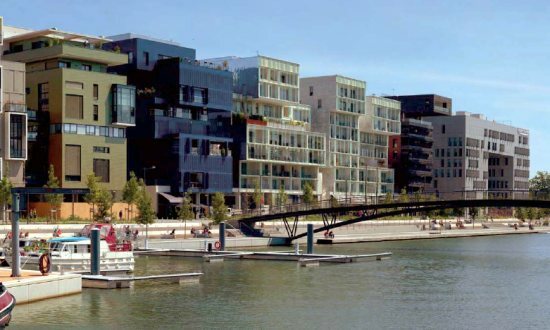 In 2003 the City of Lyon launches the urban renewal operation, aiming to configure a space with a high quality of life, affordable housing, mixed uses and cultural activities, and the seat of the Rhône-Alpes Regional Government. 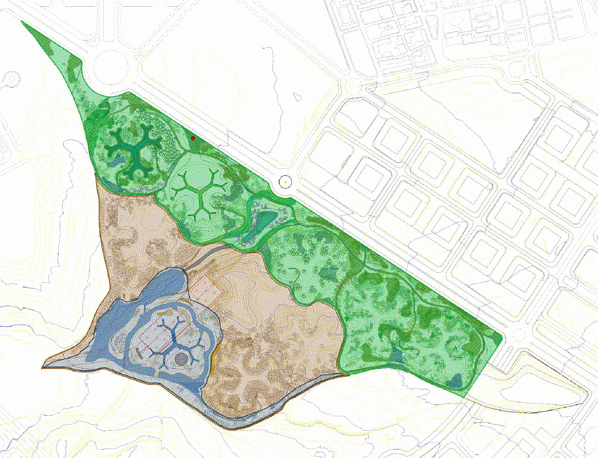 The project area covers 150 hectares, 70 of which correspond to lots and 35 to public spaces. 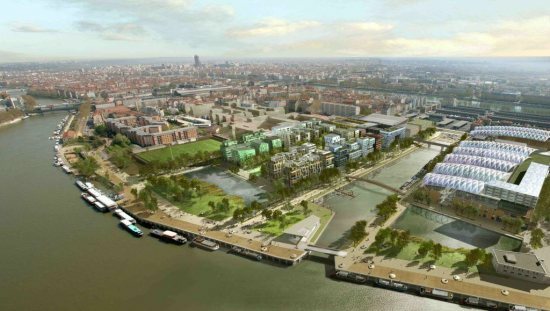 The area is to reach a 16.000 population with 25.000 jobs, including high energy efficiency buildings and a reduced water use. Any part of the operation is less than 400 m from water and a public transit stop. The flood risk is reduced by minimizing the soil paving (less on-street parking, grass planted public spaces) and through a design that includes canals. Public spaces and buildings have been designed with water and built heritage in mind. In 1953 the Netherlands were subject to terrible floods. As a country located on the Rihne delta, with a large portion of its land under the sea level, the risk of flood is always high, but at that time a sizeable storm over the Northern Sea, touching also Britain, Belgium and Germany, made the sea level rise over 4 meters as related to its usual level. As this happened by night, many people were caught while sleeping, and there were over 1.800 deaths. 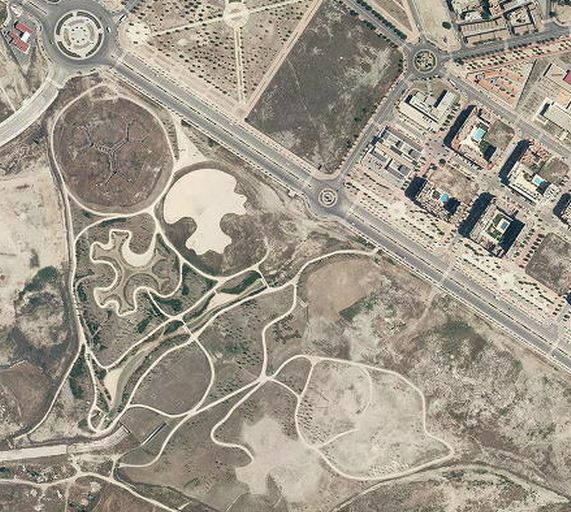 A coastal protection plan was implemented, creating one of the most abstract and impressing contemporary landscapes, with a figure as target: 4.000 years, the period in which, as a statistical average, there would be a flood large enough to overcome that barrier with the same effects as the 1953 flood (in Spain, for instance, a lot is deemed subject to flood risk if that time is 500 years). The giant cost of the works and their maintenance has been compensated, at least partially, by a Dutch- specific know-how that is exported. 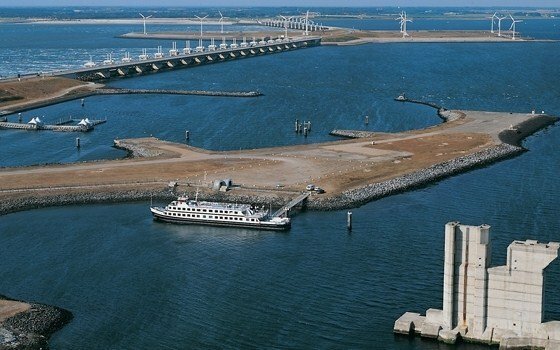 I have visited the Netherlands, but never this area; the upper image (taken from http://www.holland.com) shows an entireley abstract and artificial landscape, in which every element has a logic. The original calculations for the Delta Plan have been altered by the climate change forecasts and the knowledge derived from the 2005 Katrina disaster in New Orleans. The Netherlands are reexamining their flood protection policy, wich is the same as saying they have to rethink half their country. The introduction of modern sewage in the XIXth century was largely related to the invention of the modern wc. This device had undeniable health advantages, but a clear problem: the need for a water volume that, combined at the scale of large cities, can become relevant. According to New York’s PLANYC, some years ago that city was considering a new reservoir to cope with a rising water demand; the final solution was a wc renovation program, with model whose water demand was lower, as to eliminate the need for the new reservoir. On the other side, the disposal of used water also requires a costly infrastructure. – Become an aspirational next generation product that everyone will want to use in any nation. The result has been a series of grants to varied institutions to develop prototypes. 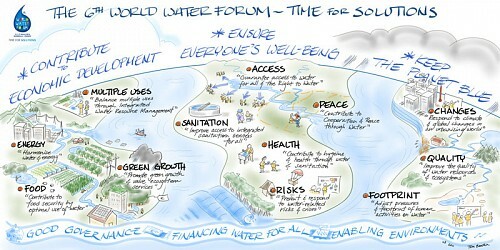 A wonderful idea for developing countries, a chance to reduce infrastructure and environmental impact in any country. What to do when there is no fresh water nearby? either you make a long aqueduct to bring water from a distant source, or you use a desalination plant if salt or brackish water is at hand. This has been done in some parts of the spanish southeast coast. The Bajo Almanzora desalination plant brings water to an intensive cultivation area without need for long aqueducts. 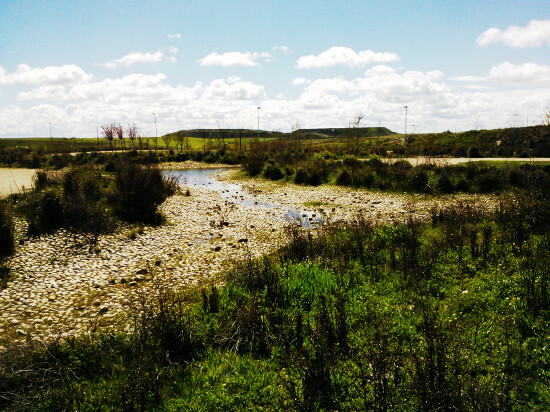 With a production capacity of 20 cu hm of water per year and a 75,9 million euros investment (23 of which come from European funds), the 150.000 people and the farmers in the area access a more reliable water source than what is normally available in this dry area. Using an inverse osmosis technology, the factory ensures the brine (water with a much higher salt concentration that is discarded as a result of the desalination process) is brought to an environmentally adequate discharge point through a 2,5 km pipe (the sea is close to the plant, as you can see on google maps). The plant takes no more than 5 hectares on the ground. I don’t know the accurate data on this plant, but if we take an average efficiency of 4 kwh of electricity for each cu meter of desalted water (an usual value for such plants), the yearly demand of 20 cubic hectometers would be 800 Mwh of electricity. With wind farms usually beyond 50 Mw of installed capacity, this can be done on renewable energies (altough it is not always the case, and a connection to the grid is needed for those days in which the wind is not blowing). As an example, a specific publication on the issue. According to data from the World Water Forum (Marseilles 2012), in 2030 the per capita use of water in the world is set to rise by 40%, and 47% of the world population will be in areas under water stress. Agriculture will take about 70% of the resource, and industry and energy 10%. The amount of renewable fresh water that could be obtained by person will have dropped to less than a third of the 1950 figure, to be around 5.100 cu m (largely due to population growth). The UN website publishes interesting statistics. 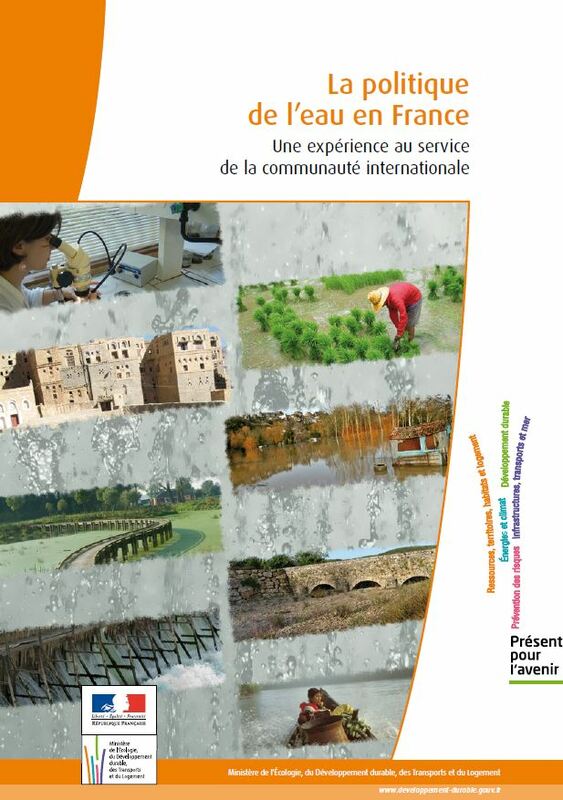 In this context, the water policy in France is based on the 1964 Law on watersheds (eight large watersheds in the European French territory and five in the overseas territories), the 1992 Law that establishes the balanced management, and the 2006 law on water and water environments. The Grenelle 2 Law sets the measures to control losses in transportation and to reduce the use of phytosanitary products. The management of flood zones is based on the 2007 European Directive on the issue. The French system integrates public participation in the definition of the Schémas Directeurs d’Aménagement et Gestion des Eaux (SDAGE).